This image depicts a lot of what Coney Island is about; its artistic nature is exhibited by the Coney Art Walls. The roller coaster is representative of the thrill and amusement of the park. The bright colors and shining lights are symbolic of Coney Island’s frolic. 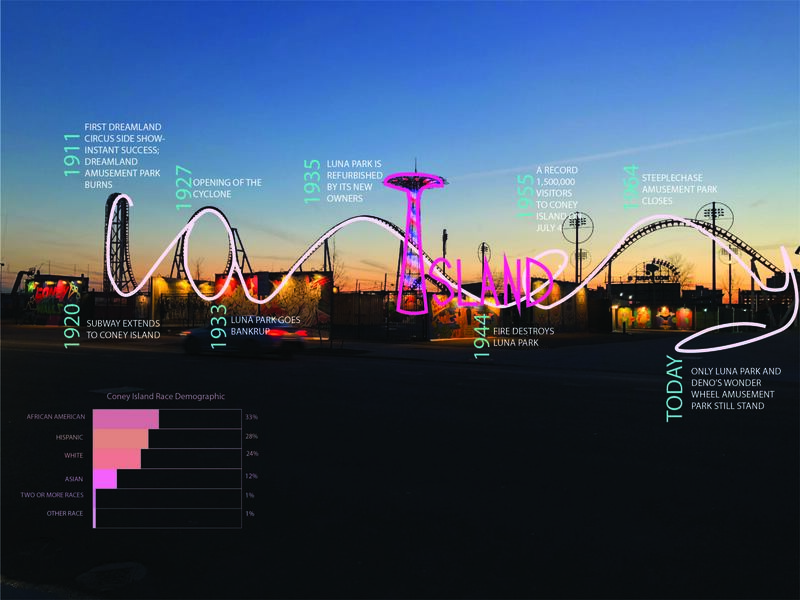 I collected data about important turning points of Coney Island over time. These facts have impacted and shaped what Coney Island is today. 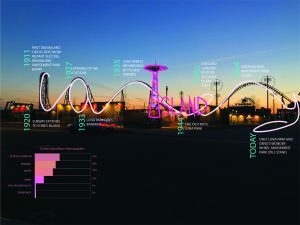 I displayed the data in a timeline following the structure of the roller coaster. I also displayed the race demographic of residents of Coney Island because despite the fact that many tourists do come to visit Coney Island from other states or even other countries, majority of Coney Island visitors come from nearby. This shows the different types of people who live in the neighborhood. Coney Island’s main population groups today are African American, Hispanic, and recent Russian immigrants.